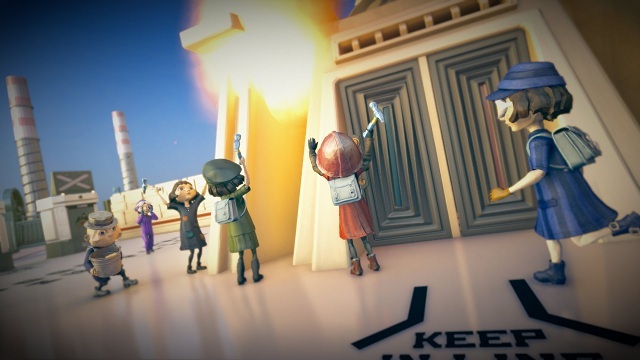 The PlayStation 4 title, The Tomorrow Children is now available. The game is set in a Soviet-styled future where you try and rebuild society. In it you build up your town and gather the necessary resources. Along with making your town grow you must also defend it from giant monsters called Izverg. A number of new features have been added since the the beta. Thru Matryoshka dolls you can “restore” your town. Once a town is fully restored you will move to another and you will rewarded for the restoration. “Toil Chips” can be found randomly and Freeman dollar drops have returned. You can have more than one type of tree in your town now, also there will now be different colored terrain. A feature that’s been announced will allow you to invite friends with a free version of the game, however it won’t be available until an update later this month. There were also a number of new improvements made, which you can see if you follow the link below. The Tomorrow Children is now Available for the PlayStation 4.